It sounds so wonderful to be thought of as the first South African Master Chef. Ben introduced me as a possible contender for the South African production when I cooked with Jonathan Daddia. For those of you who have watched or are watching, Jonathan is a contender for Master Chef Australia season 2. I love the idea of competing but it could never be a reality. I cannot imagine living in a house with 23 other people. Just living with Dave is enough. And then actually sharing a room and sleeping in a single bed in a dorm style room. Oh, and did I mention sharing a bathroom with strangers? Can you imagine how my OCD personality when it comes to cleanliness could be freaked out by a stray hair, or sock! I am a neat freak in the kitchen and my cupboards and fridge are super organized. I am even tempted to sort my friends fridges out for them when I visit. I do not like mess! I would miss my routine, my dogs and most of all, I would miss my husband! I do not like to share some things, but the one thing I do share is recipe ideas. The first time I came across poppy seeds in a dish I liked, was at Pomegranate and I have shared the idea of using poppy seeds in my crayfish curry. I am not sure why I need to type my name and email each time I want to post a comment whereas on Cin’s page my details remain there :-(. Anyways, it would have been more viable if you where the judge or one of the panelists rather than a contestant that will be expected to produce a classy meal on such a short time given. I also try and organise my sister’s fridge and cupboards because I just cannot stand the mess, hehe! I am not sure why either 🙁 your comments come through as approved! I would love to be a judge 🙂 I have not tried to do my sister’s fridge yet! Yay, I am not the only person with cleanliness OCD issues! Cheers to you and I. 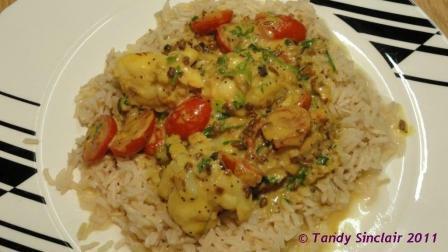 What a great idea adding poppy seeds to your wonderfully decadent curry. I agree, Tandy – I would also never be able to share a house with so many strangers! The crayfish curry sounds excellent! I’m a bit put off by all things reality tv but not by crawfish curry. These are flavors that I adore. The recipe looks very interesting. I would never be able to deal with the living with so many people in such a stressful situation thing. I don’t know if the people on those type of shows in your country act like half drunk monkey fools, but they people on American reality/game shows do. I think the chef reality shows around the world don’t seem to have idjits in them but even 23 sober people would not make me want to do this!